A university team of physicians, veterinarians and animal behaviorists has begun training a pair of very special canines to sniff out cancer. 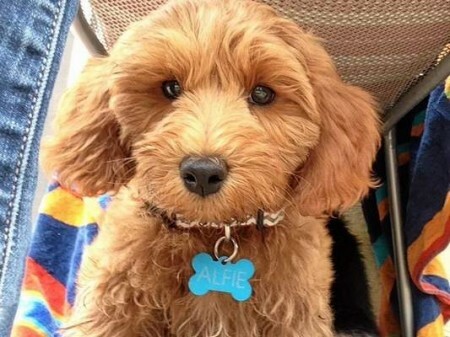 One of the 4-month-old puppies is Alfie, a Labradoodle. months old. UC Davis clinicians are hoping to advance cancer screenings with the innate olfactory skills of man’s best friend. A university team of physicians, veterinarians and animal behaviorists has begun training a pair of very special canines who may represent high-tech health care on four feet in the effort to better screen for cancer, especially at early stages of the disease. About 4-months old, the puppies Alfie (a Labradoodle) and Charlie (a German Shepherd) are undergoing a rigorous twelve-month training program to develop their abilities to identify the scent of cancer in samples of saliva, breath and urine. According to sensory scientists, the olfactory acuity of dogs enables them to detect odorant concentration levels at 1 to 2 parts per trillion, roughly 10,000 to 100,000 times that of a human. UCD physicians and researchers believe Alfie and Charlie have the potential to add an important diagnostic element to patient care. Cancer is the second leading cause of death in the United States, and early detection of the disease gives patients the best chance of survival. Hilary Brodie, professor and chair of the UCD Department of Otolaryngology, hopes that the identification of these molecules will lead to innovative and readily available methods of detection. “Much like the hand-held devices used to detect alcohol, drugs and explosives have revolutionized our safety, having a new tool to detect early-stage cancer would have incredible benefits for patient care,” noted Brodie, whose department treats many head, neck and throat cancer patients. Researchers have established that dogs can recognize melanoma as well as bladder, lung, breast and ovarian cancers. Canines have been successfully trained to distinguish the breath samples of lung and breast cancer patients from those of healthy volunteers. Such promising results have cancer experts at UCD enthusiastic about the potential for the dogs to represent a safe, noninvasive method for detecting cancer before it is too late. Current cancer screening methods frequently result in the disease being identified at a later stage, often past the so-called golden hour when treatment is most effective and when the cases aren’t as challenging. “Identifying patients at earlier stages could be extremely helpful in the fight against cancer,” said Gregory Farwell, professor of otolaryngology and director of the university’s Head and Neck Oncology and Microvascular Surgery program. Alfie and Charlie are being trained by Dina Zaphiris, director of the In Situ Foundation in Chico. Zaphiris has trained more than two dozen dogs in their ability to detect cancer. As in training for drug and explosives detection, the UCD canines are learning how to distinguish samples from cancer patients and healthy individuals. According to Zaphiris, almost any dog can be trained to detect cancer. She prefers German Shepherds, Labradors, poodles and herding breeds because of their work ethic. Alfie and Charlie’s human-cancer screening work will begin in early 2016 with a clinical trial to establish the safety and efficacy of the new diagnostic canine approach. UCD physicians say their ultimate goal is to bring more comprehensive cancer-screening capabilities to the public.